Sbornik pro Filosofii Mystiku a Okkultismus (Almanac for Philosophy, Mysticism and Occultism). 1/1, 1897-1910. This originated as a Martinist journal issued by the famous Blue Star (U modre hvezdy) lodge in Ceske Budejovice. 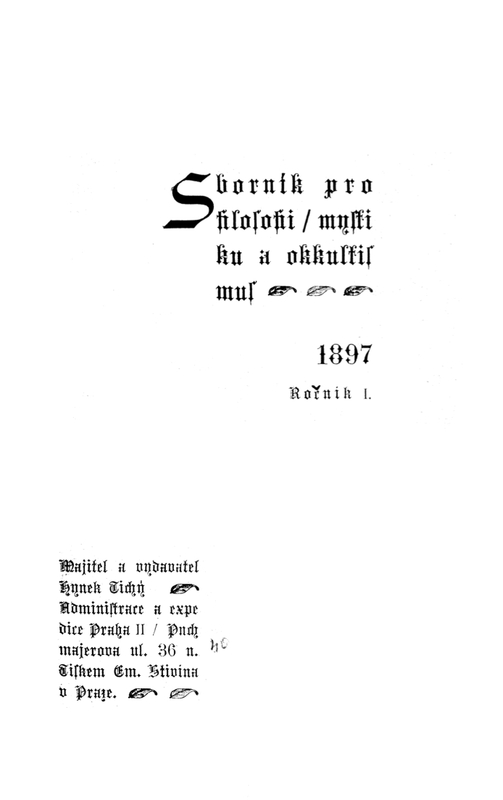 Discussed in Peter Kalac, “A Brief History of the Czech Esoteric Scene from the Late 19th Century to 1989,” www.dcch.grimoar.cz, and noted in in Lucifer, Wahrheit-Sucher and Voile d’Isis, 1897, and in L’Initiation, 1898, as a new journal. The journal contained translations from Papus, Sedir, Jollivet-Castellot, Stanislas de Guaita, and Maeterlinck, and contributions by Jiri Karasek ze Lvovic and other prominent Czech occultists. Beginning in 1898 the journal carried as supplements Sfinx and Gnosis, the latter of which later became the organ of the Czech Neo-Gnostics. Booksellers’ catalogues list a journal called Pentagram: Sbornik pro filosofii, mystiku a okkultismus, dated 1919-1920, which may be an extension or continuation of the journal.